Where would I be without my blender and handmixer..? 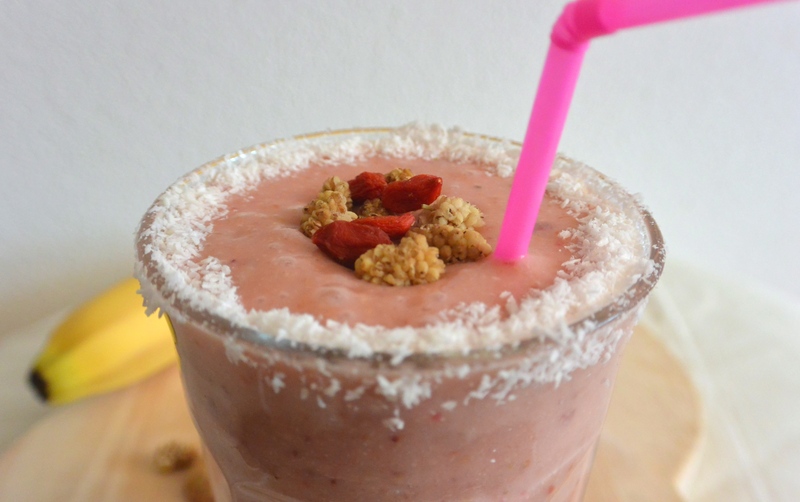 A lovely pink smoothie with the fresh taste of lemon, strawberries and coconut. Savoury because of the cashews! Lots of vitamins and minerals! This smoothie is great as a breakfast dish, but also ideally as an afternoon snack. Blend everything until smooth with a blender or a handmixer. You can soak the cashews in advance to make them easier to blend and digest. Serve in a tall glass and garnish with some mulberries, gojiberries and shredded coconut. Posted in Breakfast, Juices and smuices, recipes, Snacks, VeganTagged breakfast, dairyfree, fit, food, fruit, glutenfree, glutenvrij, healthy, healthy breakfast, healthy lifestyle, healthy snack, natural, nuts, ontbijt, raw, recipe, smoothie, snack, soyfree, sugarfree, suikervrij, vegan, zuivelvrijBookmark the permalink.